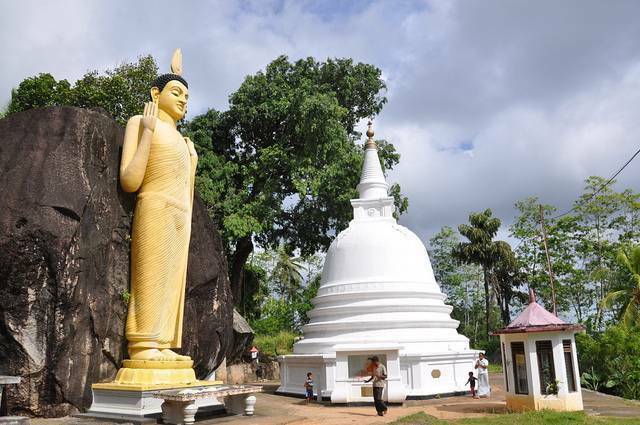 A fine place for temple lovers, the Yatagala Raja Maha Viharaya is located just inland from Galle. This is a quiet, rock temple with a 9m reclining Buddha. Built around and within giant boulder like rock formations, the temple has a soothing view of the paddy fields and small villages located near to it. Ancient caves and wall paintings can be sighted here. This temple has received the Royal patronage from three kings of Sri Lanka. The fascinating thing about this temple is that the murals on the walls are painted in the typical Kandyan period style. The Monks residing at this place have been living here since around 1500 years. The lack of huge crowds only adds to the appeal of this temple. You can have a great view of the rice fields by ascending a flight of stairs. There is an ancient Bo Tree here which is believed to be an off shoot of the revered Sri Maha Bodhi at Anuradapura. At the far end of the temple there are three huge rocks under which a cave is situated. This cave is basically damp and sweating but looks mysterious. A visit to this place is a very nurturing and grounding experience. This place proves to be a beautiful way to connect with the nature and the roots of all beings. It is particularly worth a visit by anyone who is interested in or practising Buddhism!